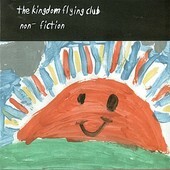 Despite the poor cover art and shoddy packaging, The Kingdom Flying Club's Non-Fiction is nice album, an indie-rock album that covers a lot of ground yet still stays focused. Whether its jangle-y pop ("Artists Are Boring"), post-punk rock ("Let's Dance! "), light indie-rock ("Simple Sense"), or acoustic rock ("We're Nothing New"), the band manages to keep their own stamp on each sound. Played loose and sometimes sloppy, but with plenty of enthusiasm and love, The Kingdom Flying Club are an indie-rock band through and through, living up to its principals in every way, and in the process creating an interesting, quite promising record of lots of rock and tender moments. I'll give it a B-.